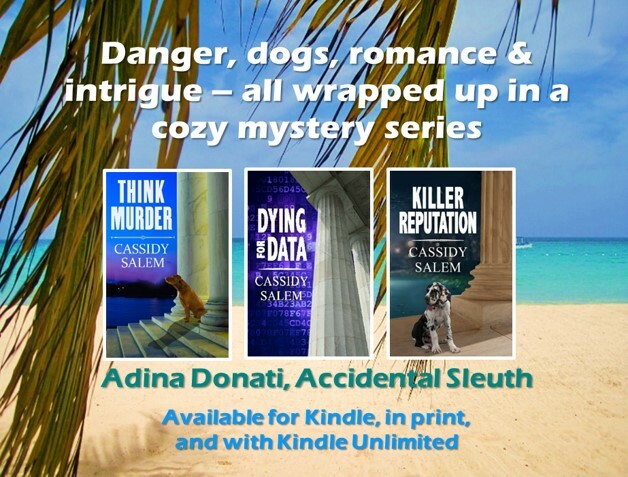 As part of a Blog Tour organized by Great Escapes Virtual Book Tours to celebrate the release of Death by a Whisker: A Cat Rescue Mystery, T. C. LoTempio stopped by to share her thoughts on writing murder mysteries. Enjoy. If you’re a fan of mystery series, and MURDER SHE WROTE in particular, you might have heard of something called “Cabot Cove Syndrome”. Which is a term for a locale or a person whom death and mystery seems to stalk – ad nauseum! Not a funny thing when you’re a writer of said mysteries! Plotting a mystery, particularly a murder mystery, is hard enough work! How many bodies can one stumble on before you get a “body magnet” label attached to you, as Nora Charles in my Nick and Nora series has! (although sometimes it’s hard to tell whether she or her cat, Nick, is the body magnet). Syd McCall in my Cat Rescue series is also well on her way to getting the same distinction! Becoming a BM could be construed as a problem when writing a cozy series. How does one avoid boring the reader? Well, one way is to alternate the murder weapon – this time, a gun; next time, a knife, the time after that, poison—and so on. Alternate the mode of discovery as well. And even though the Nick and Nora series always starts out with a murder in its prolog, sometimes it’s good to wait a bit to have a murder occur in the body of the story until readers become invested in your characters! If they build up a rapport with your sleuth, they might be a tad more forgiving as to why so many folks come up dead in his/her balliwick! In short, where murders occur – and why – are just one of those things you can’t explain, one of life’s little mysteries. Which is my response when cynical readers remark on Nora’s penchant for coming across a dead body – or two, or three. Sit back and enjoy the ride, and if you have to, channel your inner Jessica. You might end up solving the crime right along with our sleuth. Click here to enter a Rafflecopter for a chance to win a $25 Amazon Gift Card. While Toni Lotempio does not commit – or solve – murders in real life, she has no trouble doing it on paper. Her lifelong love of mysteries began early on when she was introduced to her first Nancy Drew mystery at age 10 – The Secret in the Old Attic. She (and ROCCO, albeit he’s uncredited) pen the Nick and Nora mystery series from Berkley Prime Crime – the first volume, MEOW IF ITS MURDER, debuted Dec. 2, 2014. Followed by #2, CLAWS FOR ALARM . #3, CRIME AND CATNIP , was released in December. She, Rocco and Maxx make their home in Clifton, New Jersey, just twenty minutes from the Big Apple – New York. Catch up with them at www.tclotempio.net and www.catsbooksmorecats.blogspot.com. Thank you for the information on “DEATH BY A WHISKER” by T.C. LoTempio and for being part of the book tour!